One of our presents this year was a copy of Mrs Bradshaw’s Handbook by Terry Pratchett and The Discworld Emporium. While it is an invaluable guide to the Discworld railway and the various towns and villages on the way as the railway spreads out from Ankh-Morpork, it was published without an index. So, for curious readers who don’t have the time, but do have the inclination, here’s Mrs Bradshaw’s Handbook Index. This is, of course, a work of fiction, but the categories of information closely follow those of a modern travel guide and the original Bradshaw’s Guides. Dwarf, troll and travellers of other species will find entries to enable them to travel on the new railways. And all travellers will find detailed information about the many towns and villages, interspersed with vignettes and stories gathered by Mrs Bradshaw. And there’s a lot about cabbages! This entry was posted in 2014, My indexes and tagged Discworld Emporium, index, Mrs Bradshaw's handbook, Terry Pratchett on December 29, 2014 by icemaiden1964. Merry Christmas and a Happy New Year? Many people get given books at this time of year. A fair proportion will be non-fiction, perhaps an autobiography, a biography, a memoir, some prize-winning non-fiction, a celebrity cookery book, a TV tie-in general interest book, a travel book about somewhere you want to go, a craft book about your latest hobby. Perhaps you bought yourself a present as well, or you’re going out soon to spend a book token or other gift card carefully on something you’re interested in. I bought my husband a copy of Guy Martin’s autobiography, but I’m hoping to get to read it before he does! Have you got to the point where you’ve checked the index yet? Do you use the index when you’re choosing a book? Was the index in your book any good? Did you find what you wanted? Did you have to wade through a long list of page numbers and then not find what you hoped for? Connect all the terms used by the author and all those likely to be sought by the reader with a web of cross-references so nothing is missed, no matter where the reader begins to search. Use subheadings to add levels of detail, making retrieval faster and more specific, and preventing readers from having to wade through long strings of page numbers to find what they want. Use qualifying notes to resolve ambiguities. Distinguish between material in footnotes, illustrations and tables. Make sure the index is clear, comprehensive and internally consistent. I’m particularly interested in history and archaeology, cycling and fitness, but would be happy to take on books in other general interest subject areas. If you’re an author or an editor looking for an indexer, please don’t hesitate to get in touch via my contact page. This entry was posted in 2014 and tagged autobiography, guy martin, indexer, non-fiction on December 26, 2014 by icemaiden1964. Sam Leith, who is described as a journalist, columnist and novelist in his Wikipedia entry, has recently accepted the position of “President of the Society of Indexers”. This news has made me absurdly happy. While the outgoing post-holder, Professor John Sutherland, has often commented on the absence of indexes in books he has seen, such as Salman Rushdie’s memoir, entertained Society of Indexers members at our annual conferences over the years and been a stalwart supporter of all we indexers do, he’s obviously “old school”. Nothing wrong with that, he was born before WWII after all, but at a time when indexers are struggling to find their way into the 21st century and make our skills relevant for readers at this time, it is brilliant news that a young(er than me), media savvy person with quite a big following, has seen it appropriate to accept the role of “President of the Society of Indexers” into his portfolio. I’m hoping to see a lot of Tweets from @questingvole, Sam’s Twitter tag, and other media mentions in the publications he writes for that help to raise the profile of the society and the relevance of the work of indexers to 21st century readers. And I look forward to meeting Sam at the Society’s conference in York next September, which we’re holding jointly with the Society for Editors and Proofreaders. This entry was posted in 2014, Uncategorized and tagged @questingvole, John Sutherland, President, Sam Leith, society of indexers, Twitter on November 22, 2014 by icemaiden1964. Promoting your book – don’t forget the index! One of the fun things about being an indexer is being invited along to launch events and other activities related to the books you index. 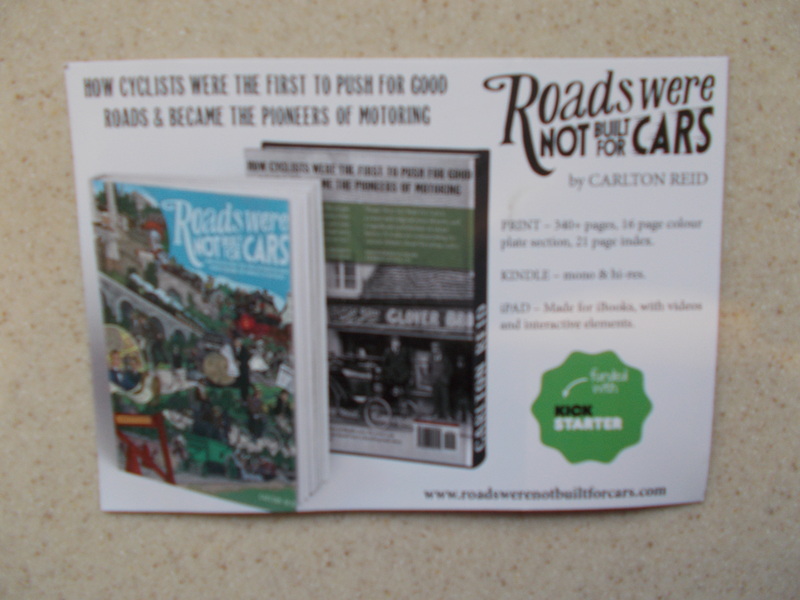 Last night I went to Oxford to hear Carlton Reid talk about Roads were NOT built for cars to Cyclox, a cycle campaign group. And, of course, it was a great talk. However, one of Carlton’s selling points for his book is …. the index. Look, he’s put it on a little promo card that he hands out. And as he’s sold out of the first printing of the book already, it must work, right? Great to be in Oxford as always. The location of the talk, St Michael’s in the Northgate, was the church where my marriage banns were read out. But I wasn’t married there. Cycling in Oxford is something touched with sadness for me because, just after I left, my ex-flat-mate was killed while riding her bike near Magdalen College. So if any of the campaigning that Cyclox do stops another death of a young person, it will have been worth it. This entry was posted in 2014 and tagged built, Carlton Reid, cars, cyclox, index, oxford, roads, Roads Were Not Built For Cars, st michael on September 17, 2014 by icemaiden1964. The Hollywood Musical by Jane Feuer, published by Indiana University Press, 1993. Single author text. Genre, Gender, Race and World Cinema edited by Julie F. Codell published by Wiley-Blackwell, 2006. An anthology by numerous authors. Atlanta and Environs by Franklin Garrett, published by University of Georgia Press, reprinted 2011. A monster of over 900 pages with an index, and one of a series of books, the person complaining said they were not detailed enough. Duras: Femme du Siecle. Papers from a conference in held in London in 1999, in French. Twelve Views of Manet’s Bar. Twelve essays about one painting. Published by Princeton University Press, 1996. Economic Report on the Philadelphia Metropolitan Area 1985 by Anita A. Summers and Thomas F. Luce. Philadelphia University Press. Transformation and Convergence in the Frame of Knowledge, Torrance, T. F., published by Wipf & Stock, 1998. Thomist Realism and The Critique of Knowledge, by Etienne Gilson, Ignatius Press, 2012. An Eastern Way of War: The Republic of Korea’s Troops in the Vietnam War by Nicholas E. Efstathiou, a Kindle publication, reader using an e-book version. Discipline and Punish, by Michel Foucoult, a translation published by Penguin, and another volume Power/Knowledge published by Random House. Actually, I don’t think they have anything in common except the lack of an index. Some of these publications date from before the internet and e-books were ever thought of, some have been released in the last few years. Some come from language traditions which don’t usually have an index. All have ended up on a reading list or have been sought out by the students as necessary reading for their courses or research. All I can say to authors and editors is, please, spare a thought for future readers and students. Readers in the future can’t count on an electronic version being available, so it surely makes sense to include a back-of-the-book index. For more on the differences between free text searching and indexes, see this useful page. This entry was posted in Uncategorized and tagged Atlanta and Environs, barthes, books without indexes, camera lucida, computer search, discipline and punish, Duras, eastern way of war, Genre Gender Race and World Cinema, Hollywood Musical, human searching, Indiana University Prss, King John, michel foucoult, no index, penguin, Plato, torrance, University of Georgia Press, Wiley-Blackwell, Yale University Press on May 26, 2014 by icemaiden1964. Arch. J. indexes – sounding a death knell or heralding a new age? I have, for longer than I care to remember, maintained membership of the Royal Archaeological Institute. It is an organisation that anyone can join and for a relatively modest sum each year receive a copy of the Archaeological Journal, the summary of the annual field trip, attend lectures if you so desire and use the library of the Society of Antiquaries. I think the latter was the reason I joined, and membership has had its uses in the past. I also like the fuzzy glow I get from supporting the grants and awards the institute makes to students and researchers. As an archaeologist who hasn’t done any archaeology for a long time I’ve been content to let the President and the various Council members, drawn from the great and the good of the profession largely get on with running the organisation on my behalf. Until yesterday. Inside their latest newsletter, Number 47, dated April 2014, is a request for members to indicate whether they would want to pay £35 for a cumulative index to volumes 161 to 170, which have been published over the last 10 years. While not all members actually seem to want an index, it seems a bit steep to ask those that do to stump up for something which used to be provided as part of the subscription because each journal itself was indexed. And particularly so when the RAI is sitting on a healthy looking bank balance. Indexes to journals are most useful when they summarise the work over a period of time, making it possible to compare what has been done in different time periods. A decade’s worth of work can show how an organisation is changing what it does, where it puts its emphasis and, by what is omitted, where it could plan to do so in the future. For a researcher having a cumulative index can make it really very easy to track down examples of things spread over many volumes. An index can also help you find things you had realised you needed to look for! The item in the newsletter mentions word-searches and e-journals as a possible way forward. The Society of Indexers has some useful things to say about why word-searches aren’t as good as human made indexes in electronic books and journals. If you’re a member of the RAI, please do contact David Hinton, the President of the society, to make your views on indexing the journals felt. But note that the newsletter got his email address wrong (again), so you’ll need to contact him via the address on this page. I’ve already sent him mine and I think we’ve started a useful dialogue. If you’re a member of a learned society, take a look at how they do their indexing now and if they’re going to make any changes in the near future. This entry was posted in 2014, Uncategorized and tagged Arch. J., Archaeological Journal, David Hinton, index, journals, RAI, Royal Archaeological Institute on April 29, 2014 by icemaiden1964. The London Book Fair attracts book sellers and buyers from around the world. This year it is being held in Earls Court. I was there with Ann Kingdom on Tuesday. We were there for two reasons. Ann participated in one of the early seminars on the first day and we were to try and market the Society of Indexers, and indexing in general, to publishers and other exhibitors, and I was hoping to target some in my areas of expertise. The seminar was a joint event with the Society of Indexers, the Society for Editors and Proofreaders, the Institute of Translating and Interpreting and the Chartered Institute of Linguists. The aim was to explore how editors, proofreaders, translators and indexers work together behind the scenes before publication and the added-value these professional bodies provide to the publishing industry. Each organisation fielded a speaker and the format was a series of questions posed by the chair, sometimes to all of them, sometimes to just one. As the audience was mixed, the information imparted was necessarily of a general nature, but the listeners gained an awareness of the special requirements of each of these professions, and the need for dialogue between authors, translators, editors and indexers to ensure that the author’s intent was preserved as their work passed through the hands of these professionals. The second reason for our attendance was to ‘spread the word’ about the Society and its activities among the exhibitors at the show. The Society has prepared a small leaflet and armed with a handful I sought out some likely targets. There were exhibitors from all over the world, so a fair number of potential targets were not relevant. The exhibitors’ booths ranged from those of large international publishers such as Hachette, who had the largest single stand area, to tiny booths with just room for one chair and a table. The purpose of the exhibitors at the fair was to sell books so they sent people to man the stands who were from marketing and sales departments. They were not the people who edit the books and who might have needed to know where to find an indexer. Ninety of the smaller publishers were represented by the Independent Publishers Guild, so together they had a larger stand area and could share the costs of attending the event. It was therefore hard to find anyone to approach among the publishers, and several of those I spoke to had previous experience of the Society. Among the publishing solutions exhibitors I found a few in the ‘self-publishing’ market who had not heard of the Society. I think this highlights how important it is for individual indexers to market themselves directly to publishers. The good news is that there were plenty of printed books on show. The death of the printed book has been greatly exaggerated. It may be hard to find work as a new indexer, but I’m encouraged that there is still a large pool of potential work out there. This entry was posted in 2014, Uncategorized and tagged institute, institute of linguists, london book fair, society for editors and proof readers, society of indexers, translating and interpreting on April 9, 2014 by icemaiden1964.